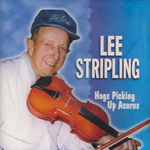 This combination of lyrical, older pop songs and swing music along with Lee’s personal legacy of the Stripling Brothers fiddle tradition has the immediate quality of making listeners cheerful. 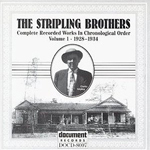 “Wolves A’Howling,” “The Lost Child,” “Pallet On the Floor,” “Possum Hollow” and “Wang Wang Blues” are all songs that the original Stripling Brothers played while such tunes as “I Only Want a Buddy Not A Sweetheart” and “That's How Much I Love You” were popular songs in the 1930s. Lee Stripling – fiddle & vocals; W. B. Reid – guitar and vocals; Tony Mates – bass; Kerry Blech – mandolin; Glenn Dudley – plectrum banjo. From “Faded Love” to “Let the Rest of the World Go By” to “Winging My Way Back Home,” the trio’s beautiful harmonies offer a soft landing between the lively swing and fiddle numbers, including “Hen Cackled,” in which Lee hits the side of the fiddle with the bow to indicate the flapping of the wings. “Sentimental Man From Georgia,” “Coal Mine Blues” and even “Birmingham Jail” make Lee feel homesick. He also drifts west with songs such as “Round Up Time in Texas”. Lee Stripling – fiddle and vocals; W.B. Reid – guitar and vocals; Bonnie Zahnow – fiddle and guitar. 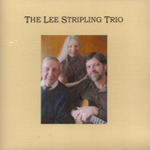 Two generations of singing refined at church and in the cotton fields adds a sweet polish to the sibling blend of voices in this small but mighty CD recorded when Robert Stripling joined Lee in Seattle to teach at the Festival of American Fiddle Tunes. Robert’s rhythmic guitar playing and choice bass runs are the perfect complement to Lee’s fiddling. This photographic exhibit, book and accompanying CD, written and produced by Bríd Nowlan and Stuart Williams and photographed by Doug Plummer, features Lee Stripling in a celebration of Washington State’s old-time fiddlers. Lee plays his father’s composition, “Kennedy Rag,” which is also written out in standard notation. Order through the Washington Old Time Fiddlers Association. Volume 1 covers the years 1928 to 1924 and Volume 2 covers 1934 to 1936. 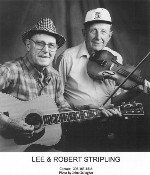 Charlie and Ira Stripling recorded 42 tunes that reflect the rich fiddle traditions of their home in west Alabama, showcasing the area’s most accomplished fiddler. The first 18 tunes were recorded for the Brunswick label, and the rest for Decca. Available at Amazon.com and elsewhere. Lee’s CDs cost $15 for “Hogs” or “Trio” (or $25 for the pair) or $10 for the “Stripling Brothers 2000” ($20 total paired with “Hogs” or “Trio”). For details on how to order, contact his daughter. Lee loves to tell the story of learning a tune in 1929 from Pleasant “Uncle Plez” Carroll, a noted fiddler born before the Civil War. He’s delighted to think that between them they’ve helped that tune draw breath for 150 years.